There's Vanessa; Eric's nauseating, demanding, self-centered 29-year-old girlfriend who just wants Eric to propose marriage to her so they can settle down and have many babies along with the house, a white picket fence, and the security that apparently goes hand-in-hand with marriage. Never mind that Eric isn't ready for kids, Vanessa DESERVES her fancy engagement ring!! Next we have Laura; a successful, driven lawyer and single mother of the smartest, most polite 8-year-old boy named Ian. Laura is so prim and proper that she barely has a personality, yet she will stop at nothing to get her former sperm donor -- and Ian's biological father -- to donate more sperm so she can give Ian a darling brother or sister. Finally, we have Wendy; an overweight, exhausted mother of a wild set of twins who won't behave under any circumstances. Her husband Darren consistently escapes into his private world of role-playing computer games and takes no interest in their children; especially since they aren't biologically his due to his inability to impregnate his wife. When the unwilling husband and father Eric learns that the sperm he donated for extra cash years ago has resulted in several children, chaos erupts and changes the lives of everyone involved forever. What Came First is magnificently crafted and genuinely unpredictable. Carol Snow writes each of her characters so colorfully that you won't help but be sucked in to the story and hang on the edge of your seat to learn what happens. Although the characters are extremely unlikable, their individual stories are so entertaining and almost horrific that you'll be dying to know what happens next. Does Eric end up with Vanessa for good? Do Vanessa or Wendy have mental breakdowns? Does Laura ever get pregnant again? Do all three women ever get together to meet and hang out? These are the types of questions that will race through your head as you read What Came First . If you're a fan of contemporary literature, don't miss out on this novel! 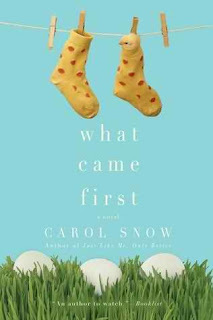 Carol Snow is also the author of Just Like Me, Only Better (2010), Snap (2009), and Here Today, Gone to Maui (2009).